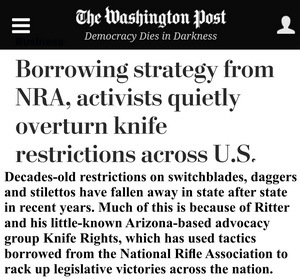 Knife Rights was featured in a front page story in Sunday’s Washington Post in an article by Todd C. Frankel that was widely republished by other media outlets. The reporter was fascinated with our success as a Second Amendment organization that in almost every instance enjoys bipartisan support as we have repealed knife bans in 21 states. It is a generally favorable article from a paper not known for its love of the Second Amendment. Click here to read the full article on The Washington Posts’ website (limited views). Frankel extensively interviewed (by phone and in person) myself and Knife Rights’ Director of Legislative Affairs, Todd Rathner, over a period of three weeks, including coming out to Las Vegas to attend the USN Gathering. Where, I should note, no act of violence was committed by the thousands of attendees carrying all sorts of knives, many of which would have been illegal before we repealed Nevada’s knife bans in 2015. Having said that, it deserves pointing out some of the more glaring errors and omissions in order to set the record straight. In his opening paragraph Frankel took pains to note that my pocket knife was illegal to carry concealed in Clark County (Las Vegas), even though it wasn’t carried concealed and so was completely legal. As were the hundreds,perhaps thousands, of folding knives over three inches long clipped to USN Gathering attendees’ pockets. I certainly appreciate most of those folks treating Frankel and his photographer with respect. Apparently unfazed by the fact that kitchen knives are by far the most common knife used to commit a violent crime, which we pointed out repeatedly, Frankel belabors the point that knives are the second most common weapon used to commit murder. And, he reports on so-called mass stabbings like they are common occurrences, which they are not. He also failed to take note these are also most commonly committed with kitchen knives. Frankel’s closing focused on our successful efforts in Texas and the tragic story of the student murdered while that effort was ongoing. As we explained to him, there is no clearer repudiation of any knife ban than the fact that the knife used in that murder was illegal to carry at the time of his murder. That didn’t stop this severely deranged individual, recently released from a mental heath institution, from committing murder. And, let’s not lose sight of the fact that murder is, itself, a capital offense in Texas. I could go on, but the real point is that Knife Rights continues to garner generally positive attention from national media in large part because we are a bipartisan organization that gains support from both sides of the aisle as we work to forge a sharper future for all Americans. We couldn’t do it without your support.